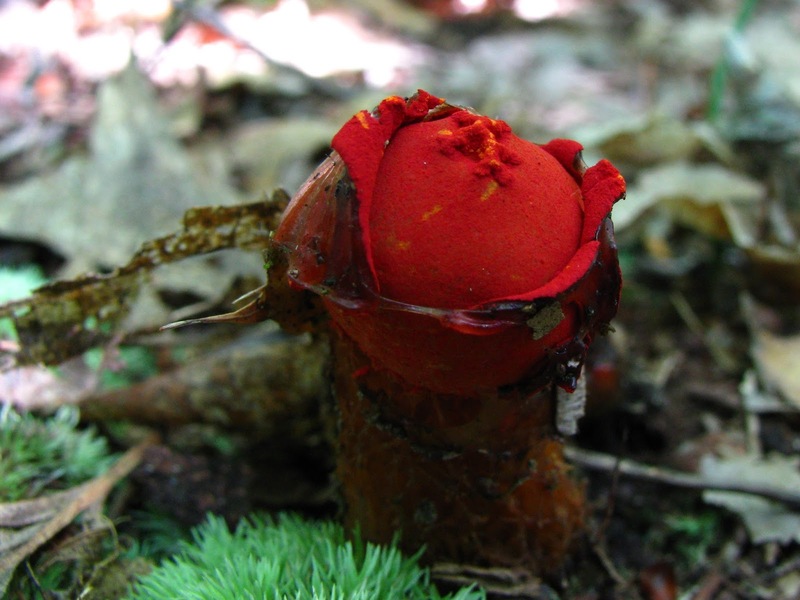 Catalogue of Organisms: Harden Up, Puffball! Near my home back in Australia, there's a park where we walk the dog most days. During the summer, when Perth receives little rain, the grass in the park dries off and the ground becomes hard. In some particularly dry spots, ground cover is absent completely (there's a large bare patch that used to house a meat ant colony; the ants died off a few years back but the nest site has never been re-claimed by grass). As autumn approaches, cream-coloured lumps can be seen in these bare patches, pushing their way through cracks in the ground. The lumps eventually crack and split, turning to dust over the course of several weeks. These lumps are Pisolithus puffballs. Mature Pisolithus 'arhizus' puffballs, copyright Paul Venter. A long-established system in the classification of basidiomycete fungi (the class of fungi that includes most familiar mushroom-forming species) divided many of the species between two groups, the hymenomycetes and the gasteromycetes. Hymenomycetes (the name means 'membrane fungi') included the classic mushrooms, with spores produced on an exposed membrane on the open fruiting body (often underneath) from which they were expelled when mature. Gasteromycetes ('stomach fungi') were forms such as puffballs in which spore-producing structures were completely enclosed within a sealed fruiting body; these structures would break apart at maturity and only then would the fruiting body open up to release the freed spores. 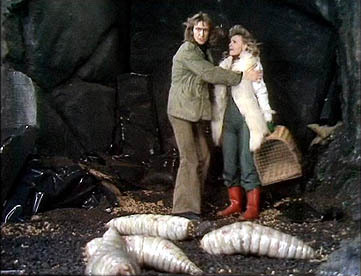 However, while the hymenomycete-gasteromycete division was certainly convenient, it was not entirely watertight. For instance, ink-cap mushrooms were clearly hymenomycetes going by their exposed membranes, but the way their fruiting bodies dissolved to release their spores was more than a little gasteromycete-like. When molecular phylogenetic studies came to be included in the mix, it became clear that the two groups were not phylogenetically distinct. Indeed, the usual poster-children for gasteromycetes, the Lycoperdaceae puffballs, have turned out to be close relatives to the most familiar of all hymenomycetes, the field mushroom Agaricus bisporus. 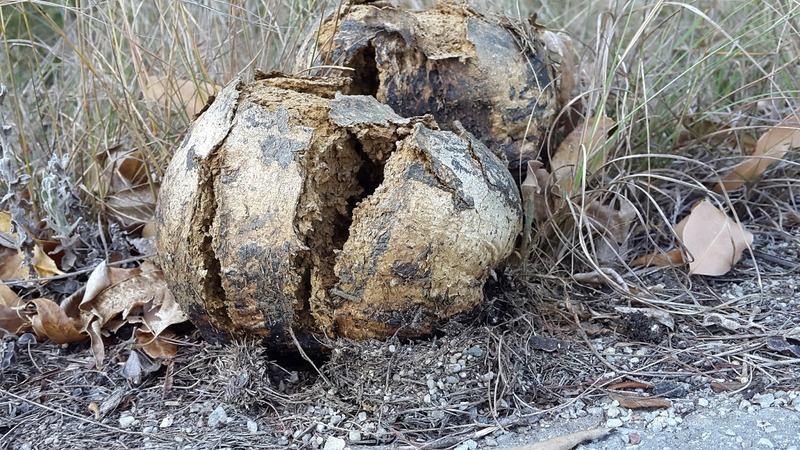 'Gasteromycetes' have evolved from 'hymenomycete' ancestors on several different occasions; a puffball is basically a mushroom that doesn't open. When molecular studies came to examine Pisolithus and a number of related 'gasteromycete' taxa, they turned out to be related to the 'hymenomycete' boletes in the order Boletales. Boletes are spongy mushrooms in which the spore-producing section on the underside of the cap is divided into pores rather than gills. Some boletes are highly regarded for their edibility, if you can get to them before other animals and insects that find them equally tasty do (others, however, are toxic, so as always with mushroom-hunting you need to know what you're eating). A new lineage in the Boletales, the Sclerodermatineae, was recognised for Pisolithus and its relatives; this lineage includes some forms that would have been recognised in the past as gasteromycetes and some that would have been called hymenomycetes. As with other members of the Boletales, most if not all members of the Sclerodermatineae are ectomycorrhizal, forming close symbiotic associations with the roots of certain trees. In most cases, these associations are essential to the well-being of both members of the partnership as the two exchange nutrients. Salmon gum mushroom Phlebopus marginatus, copyright Ian Sutton. 'Hymenomycete' genera of the sclerodermatines include Gyroporus, Boletinellus and Phlebopus. Members of these genera are more or less similar in overall appearance to other boletes, though Boletinellus has thin caps on which the stalk may be displaced to one side rather than central and the pores on the underside are less distinct. Gyroporus boletes may be characterised by features of the stalk, in which the centre has a fluffy section that dissolves over time to leave a hollow core. 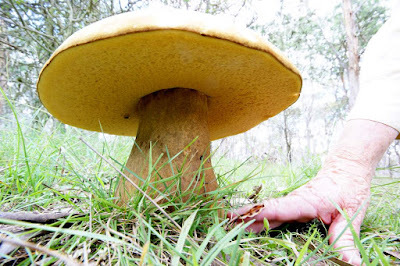 The fruiting bodies produced by species of Phlebopus can be absolutely massive: weights of up to 30 kg have been recorded for a single mushroom. Boletinellus and Phlebopus (which together form the Boletinellaceae) are remarkable in that their ectomycorrhizae are actually harmful to the trees with which they associate. Hyphae of Boletinellaceae form sheaths or crusts around the roots of trees that are not normally involved in ectomycorrhizal associations (ash in the case of Boletinellus merulioides, various trees such as citrus and coffee in the case of Phlebopus species) that provide a home for aphids or mealybugs. The bugs have a sheltered place to live, and the fungus gains nutrients excreted by the bugs as they feed on the tree roots. Phylogenetic analyses indicate that the Boletinellaceae are the sister group to other Sclerodermatineae (Wilson et al. 2012) but whether the 'gasteromycete' sclerodermatines are monophyletic to Gyroporus or not is more of an open question. Gasteroid sclerodermatines include the earthballs Scleroderma and the horse dung fungus Pisolithus. 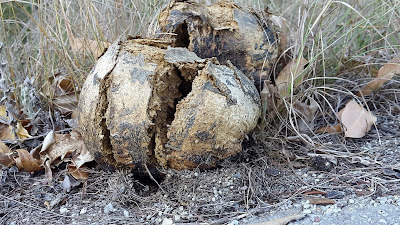 Members of these genera have hard, puffball-like fruiting bodies; in the case of Pisolithus, these fruiting bodies are so hard that they may sometimes be seen forcing their way through road asphalt or concrete. Both Scleroderma and Pisolithus have been widely used in inoculating soil for forestry and revegetation, in part because they form ectomycorrhizal associations with a wide variety of tree species. However, more recent studies have suggested that some of this apparent egalitarianism may be due to confusion between cryptic species; individual strains of the two genera may be more host-selective than previously recognised (Watling 2006). Inoculation with the wrong strain might then lead to tree growth not being helped, or even being hindered. Another example of the practical consequences of poor taxonomy! Barometer earthstars Astraeus hygrometricus, copyright Richard Sullivan. 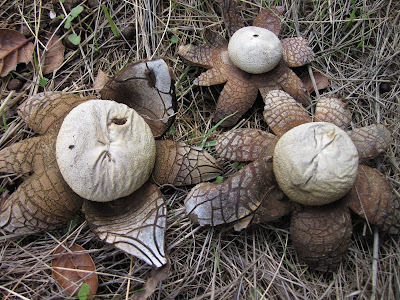 Similar taxonomic questions surround the barometer earthstars of the genus Astraeus, long recognised as a single cosmopolitan species A. hygrometricus but probably a complex of more localised species. Earthstars have a double-layered covering (peridium) to the fruiting body; the outer layer of the peridium is leathery and splits open when mature into several pointed rays, hence the fungus' vernacular name. A double-layered peridium is also found in the fruiting bodies of another sclerodermatine genus, Calostoma, but in this case the outer layer is gelatinous. The inner layer of the peridium is brightly coloured, and the appearance of the Calostoma fruiting body as the outer layer breaks open has led to the vernacular name of 'prettymouth'. Mature prettymouth Calostoma cinnabarina, copyright Dan Molter. Other members of the Sclerodermatineae are less well known. Diplocystis wrightii is a sclerodermatine known from various locations around the Caribbean that produces clusters of small globular fruiting bodies arising from a basal stroma (hyphal mass). As the upper surface of the peridium becomes dry and papery, it splits apart to turn the fruiting body into an open cup. 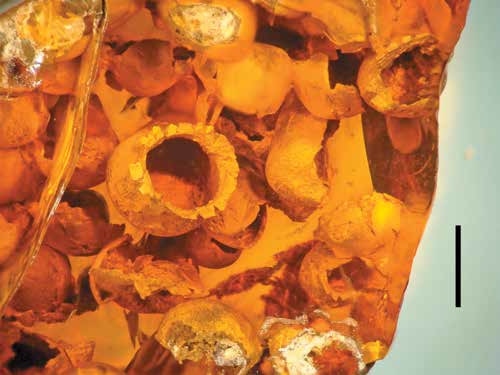 A similar arrangement of clustered, cup-shaped fruiting bodies is known in a fungus species found in Burmese amber, Palaeogaster micromorpha (Poinar et al. 2014), though structural differences argue against a direct relationship between the two. Finally, there are many other unusual 'gasteromycetes' whose affinities remain uncertain; future studies may yet assign further exemplars to the spectrum of sclerodermatine diversity. Preserved Palaeogaster micromorpha in Burmese amber, from Poinar et al. (2014). Poinar, G. O., Jr, D. da Silva Alfredo & I. G. Baseia. 2014. A gasteroid fungus, Palaeogaster micromorpha gen. & sp. nov. (Boletales) in Cretaceous Myanmar amber. Journal of the Botanical Research Institute of Texas 8 (1): 139–143. Watling, R. 2006. The sclerodermatoid fungi. Mycoscience 47: 18–24. Wilson, A. W., M. Binder & D. S. Hibbett. 2012. Diversity and evolution of ectomycorrhizal host associations in the Sclerodermatineae (Boletales, Basidiomycota). 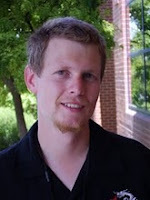 New Phytologist 194: 1079–1095.